This time, let's explore some active attacks. Active attacks that use packet injection require flashing the RZUSBSTICK and thus firmware upgrades will also be covered in this article. Friendly reminder: As always use this information responsibly. Make sure you own the equipment prior to experimentation and learning. We do not condone malicious intentions, are not held responsible for your actions, and will not bail you out of jail. The first step in a firmware upgrade is to obtain the new image. This could either be from Atmel, Luxoft, or in this case the KillerBee firmware from github. Below we show the wget command to download the firmware and the head command to show what the firmware looks like. The image below shows all of the connections necessary to flash the RZUSBSTICK. The Dragon programmer connects to the laptop via a USB cable. The 100mm female to female ribbon cable connects the dragon to the 100mm to 50mm stand off adapter. The 50 mm male to male connects the stand off adapter to the RZUSBSTICK (which is plugged into the USB stand also plugged into the laptop). You can either solder the 50mm connector to the RZUSBSTICK or you can hold the pins at an angle to make a firm connection. Since we were flashing multiple USB sticks, we did not solder the pins. Note that PIN 1 is closest to the LED. We typically get this command ready prior to the hardware being connected. That way when the hardware is connected we only need to hit the enter key. root@kali:~/tools/killerbee# avrdude -P usb -c dragon_jtag -p usb1287 -B 10 -U flash:w:kb-rzusbstick-002.hex avrdude: jtagmkII_initialize(): warning: OCDEN fuse not programmed, single-byte EEPROM updates not possible avrdude: AVR device initialized and ready to accept instructions Reading | ################################################## | 100% 0.01s avrdude: Device signature = 0x1e9782 avrdude: NOTE: FLASH memory has been specified, an erase cycle will be performed To disable this feature, specify the -D option. avrdude: erasing chip avrdude: jtagmkII_initialize(): warning: OCDEN fuse not programmed, single-byte EEPROM updates not possible avrdude: reading input file "kb-rzusbstick-002.hex" avrdude: input file kb-rzusbstick-002.hex auto detected as Intel Hex avrdude: writing flash (26818 bytes): Writing | ################################################## | 100% 2.99s avrdude: 26818 bytes of flash written avrdude: verifying flash memory against kb-rzusbstick-002.hex: avrdude: load data flash data from input file kb-rzusbstick-002.hex: avrdude: input file kb-rzusbstick-002.hex auto detected as Intel Hex avrdude: input file kb-rzusbstick-002.hex contains 26818 bytes avrdude: reading on-chip flash data: Reading | ################################################## | 100% 3.24s avrdude: verifying ... avrdude: 26818 bytes of flash verified avrdude: safemode: Fuses OK avrdude done. Thank you. When plugging into VMware, the text changes because the iProduct value above changed. Visually the KillerBee firmware will also change the blue light to amber on the RZUSBSTICK. If these changes are present the firmware upgrade was successful. In the previous passive attack article, we showed the zbid tool to list the devices. There should be a noticeable difference now. Now that we have the KillerBee firmware image loaded, we can use more interesting tools that use active techniques for discovery--including zbstumbler. This is a bit of a head nod to the old netstumbler tool as it can use active packets to locate networks (regardless of the channel). As a bonus, we can also use the same card to transmit and receive. 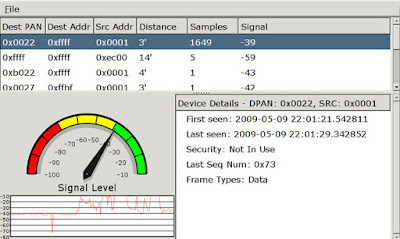 Notice in the usage and output below that we do not need to specify a channel and the card still discovered both the hub and the outlet on channel 19.
zbwireshark allows users to sniff and review ZigBee traffic in real-time within Wireshark. 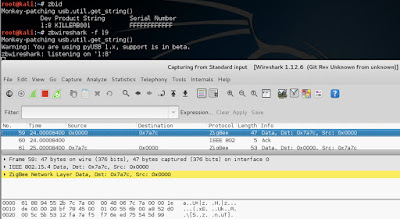 The tool creates a pipe which Wireshark then reads data from. This tool can technically be used with the default firmware since it is passive in nature, but we found it slightly more stable after the KillerBee firmware upgrade. There are still some stability issues either way. Once devices are discovered (zbstumbler) and understood (zbwireshark), the it may be possible to capture traffic and then replay that traffic back to the device. This did not work in our limited testing, but it is worth a shot. We already used zbdump in the previous article, however we will cover the syntax here for completion. The new tool here is zbreply. This tool will take the pcap from zbdump and replay it using the flashed RZUSBSTICK. 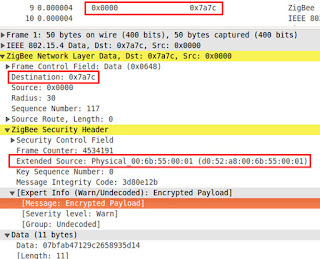 -f specifies the channel, -w specifies the name of the pcap to write the captured packets, and -r specifies the name of the pcap to read the captured packets. Similar to zbdsniff discussed in the prior article, the objective here is to obtain a key to decrypt ZigBee traffic. This tool is different from zbdsniff because it is active in nature. Instead of passively scanning a pcap, zbkey attempts to retrieve a key by sending an associate request followed by a data request after an association response is received. root@kali:~# zbkey -f 19 -p 2B55 -s 0.1 -a d052a8006b550001 Monkey-patching usb.util.get_string() Warning: You are using pyUSB 1.x, support is in beta. Sending association packet... Sending data request packet... Received frame Length of packet received in associate_handle: 27 0000: 63 cc d7 55 2b 01 00 55 6b 00 a8 52 d0 01 00 55 c..U+..Uk..R...U 0010: 6b 00 a8 52 d0 02 ff ff 02 d8 eb k..R....... Association response status was not successful. Received 2. Received frame Length of packet received in associate_handle: 27 0000: 63 cc d7 55 2b 01 00 55 6b 00 a8 52 d0 01 00 55 c..U+..Uk..R...U 0010: 6b 00 a8 52 d0 02 ff ff 02 d8 eb k..R........ --snip— Sorry, we didn't hear a device respond with an association response. Do you have an active target within range? When all else fails, it may be interesting to check the resiliency to denial of service. Fortunately, the KillerBee suite has a tool for this as well. This tool attempts to trasmit a flood of associate requests to a target network. It does require the PAN ID (-p), the channel (-c), and timing (-s). root@kali:~# zbassocflood -p 0x2b55 -c 19 -s 0.1 Monkey-patching usb.util.get_string() Warning: You are using pyUSB 1.x, support is in beta. zbassocflood: Transmitting and receiving on interface '1:34' ++++++......++++++......++++++......++++++......++++++......++++++......++++++......++++++......++++++^C Sent 102 associate requests. In the interest of full disclosure, we were not able to obtain a key or cause a denial of service. More hardware and testing is required for to complete our research. We are interested in hearing feedback from others regarding the success shown with the tools covered in this article. Feel fee to leave feedback in the comments section below. While onsite testing, it may be useful to have an attack methodology flow chart to follow. Here is one we created to help stay on track and create a repeatable process. This time, let's explore some passive attacks. This means that we will not send any packets--we will only listen to what is already being sent. Active attacks which require packet injection require flashing the RZUSBSTICK and thus will be covered in the next article. Most of the Windows software will let you know when the RZUSBSTICK is plugged in. However, if wanting to use some of the more flexible Killerbee tools in Linux, we will need to first list the available devices. For this, we use the zbid command. Now that we have a working RZUSBSTICK, let's discover some ZigBee devices use the existing firmware on the device. Fortunately, ZigBee has a limited number of channels (11-26) because we could not find very good passive options for tools that hopped through all of the channels using this hardware. Pro-tip: Try channel 19 first--it is a popular default channel. One tool seemed to have a lot of promise, but we could not get it working. 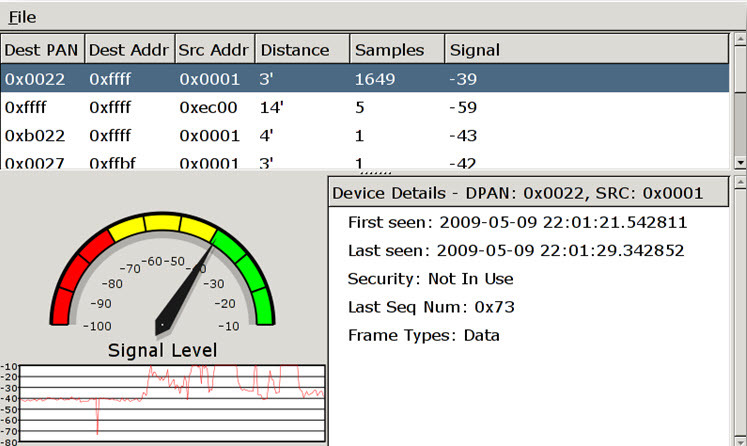 zbfind is a GUI tool with passive and active network detection features and works similar to "net stumbler". 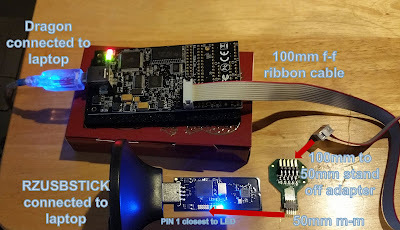 Keep in mind though that active discovery mode requires the RZUSBSTICK to be flashed with the KillerBee firmware, but even this did not help the tool function properly. The screenshot below shows promise. zbopenear is a very interesting tool in that it can listen (and write to pcap) on multiple channels at the same time (given enough RZUSBSTICKs). Since there are 16 channels, it would require 16 RZUSBSTICKs to listen on all channels at the same time. At a cost of $42.50 per stick x 16 sticks, it would be a total of $680. This tool did work but defaulted to channel 11 (the first channel). Once devices are discovered, the last phase in the passive attack is to sniff and analyze packets. Most of the Windows tools discussed in the last article have the ability to sniff and analyze packets as well. In this section, we will focus on some of the KillerBee tools. zbdump is like tcpdump for ZigBee. It can save packets in both pcap and DainTree format. For our testing we will use pcap format so we can open it in Wireshark (which natively understands the ZigBee protocol). The following command can be used to run zbdump. 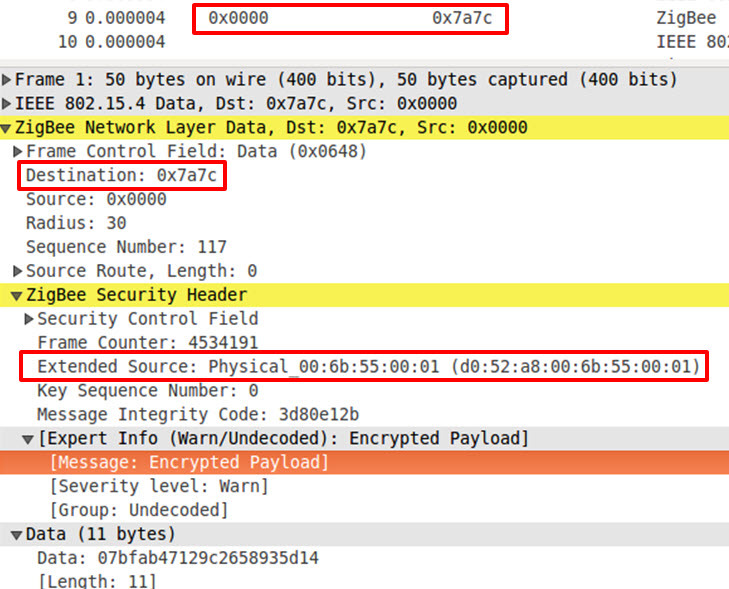 -f specifies the channel and -w specifies the name of the pcap to write the captured packets. 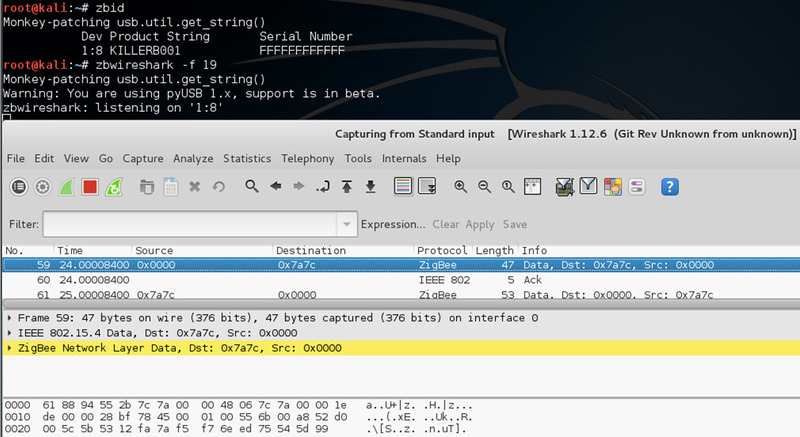 After capturing some packets, we will now open the pcap in Wireshark to learn about the protocol and components. The last passive tool on the list is zbdsniff. This tool searches pcap files for ZigBee keys. However, we did not get any output from the file--which may indicate that there were no keys available. root@ubuntu:# zbdsniff operating.pcap Monkey-patching usb.util.get_string() Processing operating.pcap Processed 1 capture files. Some of the more interesting attacks require packet injection capabilities. 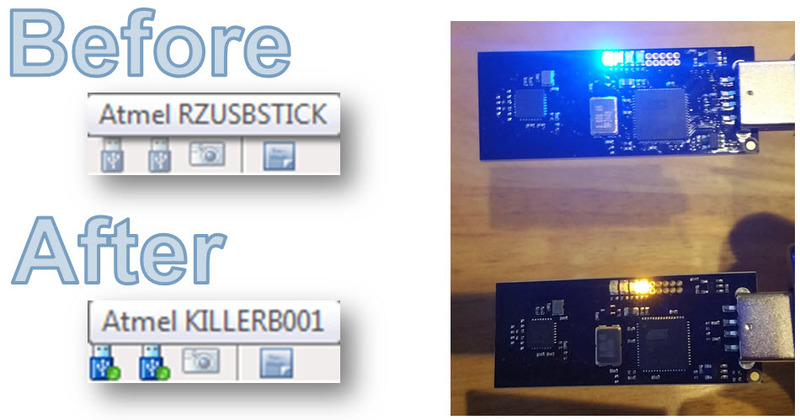 For this feature we must upgrade the firmware on the RZUSBSTICK which will be covered in the next article. We are interested in hearing feedback from others regarding the success shown with the tools covered in this article. Feel fee to leave feedback in the comments section below.